Current Promotion: Get the HTC Aria Android Phone for only $0.01! Pocket-sized and packing the power of the Android 2.1 platform, the HTC Aria mobile smartphone for AT&T offers a combination of fast 3G speeds, a responsive capacitive touchscreen display and an optical joystick help you stay in touch on Facebook, Google Talk, Flickr, and more while on the go. Offering an amazingly comfortable design, the HTC Aria weighs less than 4 ounces and measures less than a half-inch thin. The 3.2-inch display is complemented by a seven-panel home screen that provides plenty of screen real estate for apps and widgets. The Android-powered HTC Aria features a 3.2-inch touchscreen, customizable HTC Sense UI, and AT&T Wi-Fi access across the U.S. Enabled for use on AT&T’s lightning quick 3G network–with its High Speed Packet Access (HSPA) 7.2 Mbps technology–you’ll be able to easily access the Internet as well as quickly download video, music, and more. Additionally, with AT&T’s 3G network, you can make a call while simultaneously receiving picture/text messages and e-mail, or viewing Web pages. This GPS-enabled phone can access the AT&T Navigator service for turn-by-turn directions. With integrated Google technology, the HTC Aria brings one-touch access to the popular Google mobile services millions use every day, including Google Search by voice, Google Maps with Street View, Google Talk instant messaging (with presence capabilities), YouTube, and Picasa. The Aria also provides easy access to both personal and corporate e-mail, calendars, and contacts supported by Exchange Server and Gmail. Powered by the Android operating system(version 2.1) with deep integration of Google services and access to thousands of apps to customize your phone via the Android Market. Customizable HTC Scene home screen panels for creating specific home screens with apps for work, play, travel and more. Universal search: Simply start typing to begin searching your contacts, applications, Google, Google Maps, Wikipedia and Twitter. Universal search narrows down the possible results as you type, so it’s easier to find what you need. 3.2-inch touchscreen display (320 x 480 pixels) with virtual onscreen keyboard. Optical joystick control with PC-like viewing and navigation of the Web with pinch and zoom. 5-megapixel auto-focus camera with video capture capabilities. Push e-mail via Google and Exchange using support for IMAP and POP, MSN Hotmail, Yahoo Mail and AOL Mail. Google and corporate calendar supports Exchange 2003 and 2007 protocols. Rich mobile multimedia including YouTube, AT&T Music, AT&T Radio, MusicID, MobiTV, and Mobile Video. Security with VPN and SSL plus password enforcement with remote wipe. 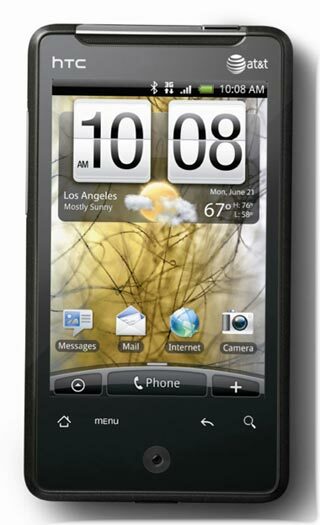 The current promotion offers the HTC Aria Andriod Phone for AT&T for $0.01 with free two-day shipping included.